The atmospheric and highly addictive new release “Behold The Abyss” by the colossal Italian doom-goth-metal outfit BLACK OATH is, from first listen a dark-treat of bombastic noise, it is both heavily melodic and highly accessible, the maturity over the past twelve-years and three albums, not counting ep’s and singles, has all led to this stunning creation, their first of perhaps many for the newly acquired label High Roller. Opening with ominous title track ”Behold The Abyss” a mournful display of clean picking which leads into a nine-minute epic of production mastery, more on the side of grunge at times than all out metal, however, with the aid of tempo changes the song manages to switch direction and tempo effortlessly, the time heavy track glides by with ease. “Lilith Black Moon” is outstanding as the band are red-hot with all cylinders pumping, a somber guitar movement into a landscape of despair, the riffs are dense and hard hitting, moaning whilst bringing the dark star of astrology breathing back to life. “Once Death Sang” the duet with Elisabeth from RITI OCCULTI, here, her voice is the shining light through the darkness, it is an outstanding respite from the intense rage, against the dramatic voice of A.Th the song lifts and twists through a dreamlike state, perfectly placed within the song cycle, the two voices soar and fall in unison over riffs straight out of the nineteen-seventies. Leading nicely into “Profane Saviour” and back into the sonic-doom, more on the side of early OZZY OSBOURNE with a highly addictive sound. As the album comes to close with a melodic reflection in “Everlasting Darkness” the album settles in intensity, guitars cry, the drums tumble through their rhythms for one last blast of thunder, an exceptional collection. Doom and Death Metal, with all its theatrics can be at times difficult to keep fresh and relevant, however, over the forty-one minutes and six tracks BLACK OATH step up to the challenge, they are fearlessly pushing their unique brand of sinister doom-metal forward, never falling into the realms of monotony, keeping it very fresh within the same scope of sound which is tricky for the mightiest of bands. 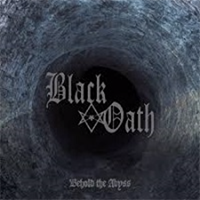 Apart from the spectacular production which has galvanized the bands sound, the songwriting is also a leap forward, the album will appeal to those who prefer their style with slight echoes from the nineties, so it is with high expectations we can await BLACK OATH’s next majestic move.